Former Obama campaign gurus David Axelrod and Jim Messina have taken their multimillion-dollar consultancies global, so it was only a matter a time before they faced off against each other. The British elections in 2015 will be waged over these competing economic visions, the country’s stomach for hard-right anti-immigrant appeals, and the candidates’ abilities to manage coalition partners. But the contest is also shaping into a proxy competition between two titans of the "No Drama Obama" campaigns who are acting out their ideological and personal conflicts on a faraway stage. As more former aides turn their affiliation with the president into lucrative consulting arrangements, the Battle of Britain crystallizes a concern among some Democrats over whether those most central to Mr. Obama’s rise should be expected in their private business to stand for his public policies and values. And if they are not, some of the president’s supporters wonder what exactly it means to work for Mr. Obama in the first place. It seems that some members of Team Obama are experiencing "anxiety" over Messina’s ideological betrayal. What right-minded liberal would just switch sides like that in order to make some sweet cash? (Of course, few complained about Messina taking money from casinos, corporations, Big Oil, and human-rights-abusing countries such as Azerbaijan.) As a result, some Democratic firms and other former allies have declined to work with Messina on the Cameron race. It’s not as though Messina just stumbled into the gig. Per the Times, he actively sought it out after Team Obama’s success in 2012, wooing Tory officials by shuttling them around Washington and introducing them to senior Obama officials. And while it’s true that British conservatives are more liberal than their American counterparts, a populist backlash against lax immigration policies has caused to the ruling party to engage in controversial tactics, such as driving vans with "go home or face arrest" billboards around immigrant communities. Enter David Axelrod, who, according to Clinton strategist Stan Greenberg, is advising Cameron’s rival in order "balance out the brand damage with what Messina is doing," and "seemed to enjoy that Messina would find it uncomfortable." The two strategists are reported to have clashed often on the campaign trail in 2012. Axelrod, for his part, declined to comment for the Times story, but Messina’s denial of any personal conflict between the two was less than convincing. "Nooo. That’s silly. Noo. We’re brothers. Noo," Mr. Messina said. "We’ve been through two campaigns and two years in the White House together. No, he is my brother, and I love him." 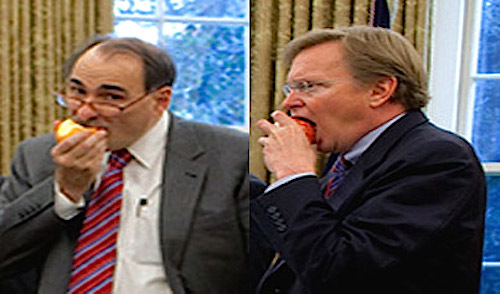 In an April 17 web video announcing his new gig with the Labour Party, Axelrod seemed to passive aggressively troll Messina, saying: "I’m drawn to this fight because it very much reminds me of the two campaigns I was involved in here with Barack Obama." 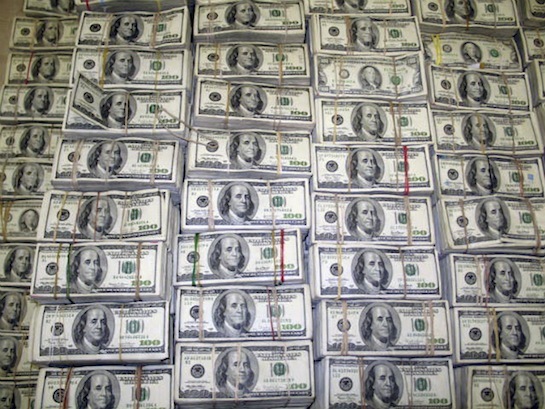 "This is ‘make as much money as you can,’ not the ideological side of the Obama project," Greenberg said. Sure. But as Messina, former press secretary Robert Gibbs, former Treasury Secretary Tim Geithner, former secretary of state Hillary Clinton, former White House budget director Peter Orszag, current White House adviser David Plouffe, and, of course, David Axelrod (among many others) might ask: what’s the difference? This entry was posted in Politics and tagged David Axelrod, David Cameron, Democratic Party, Jim Messina. Bookmark the permalink.